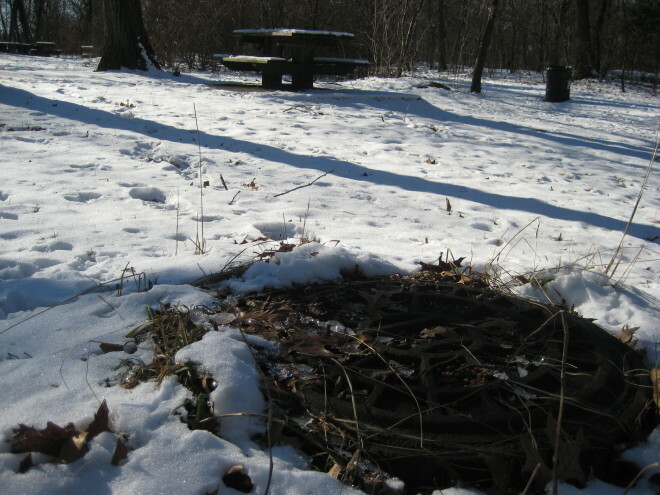 In May of 2010 the “massive underground pipe” connecting Boston to our reservoir broke, and for several days the city was under a boil-water order. 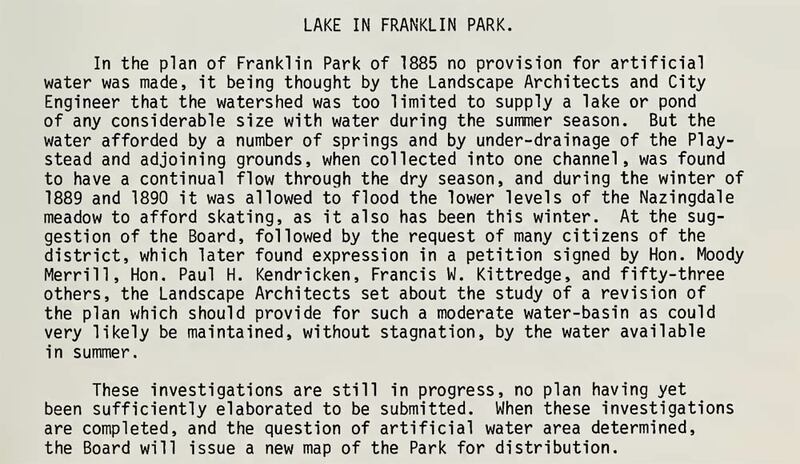 At the time, I recall it mentioned a few times that they might need to use the emergency backup reservoir in Franklin Park. At the time I had just moved closer to the park and hadn’t begun my wanderings, but I was surprised that there could be a reservoir so close to my house and I’d never seen it. Once I started reading more about the Park I occasionally found references to a reservoir in the Wilderness part of the park, but no specifics. 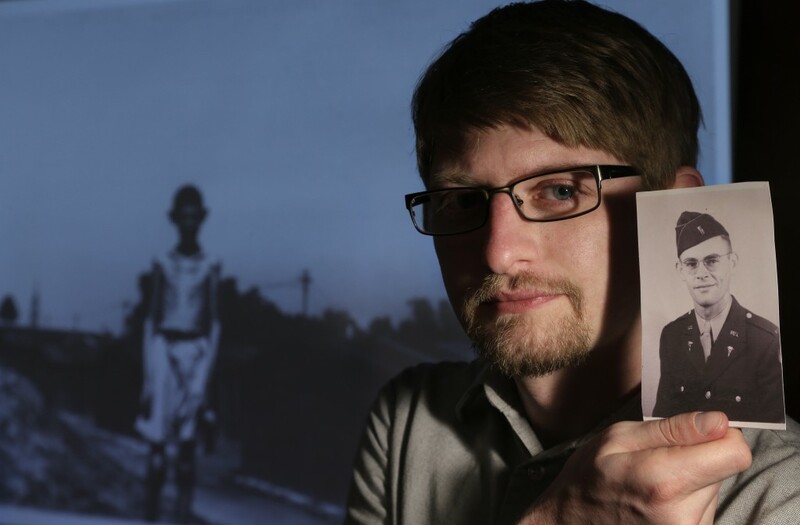 An old newspaper clipping (that I can’t seem to find online anymore) from the ’70s or ’80s mentioned the police rousting some homeless people from an underground reservoir that they entered through manhole covers, but again there were no real specifics. Cover of the 1879–1890 collection of Annual Reports, found at the Boston Public Library website. Armed only with the information that the reservoir was underground and accessed by manhole covers, I set out on my stupid and futile journey. With so much area to cover, I began in the Wilderness on the hunch that info was correct. 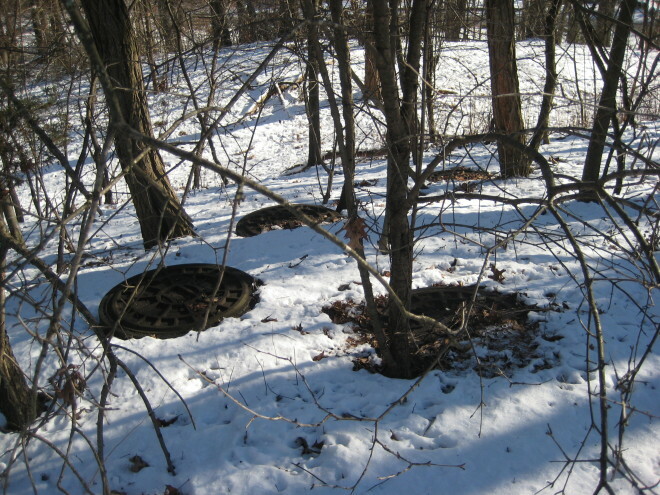 So this left me looking for a specific set of unlabeled manhole covers in about 100 acres of wooded, rocky and overgrown wilderness in Franklin Park. I should have just set out to find a talking squirrel instead. 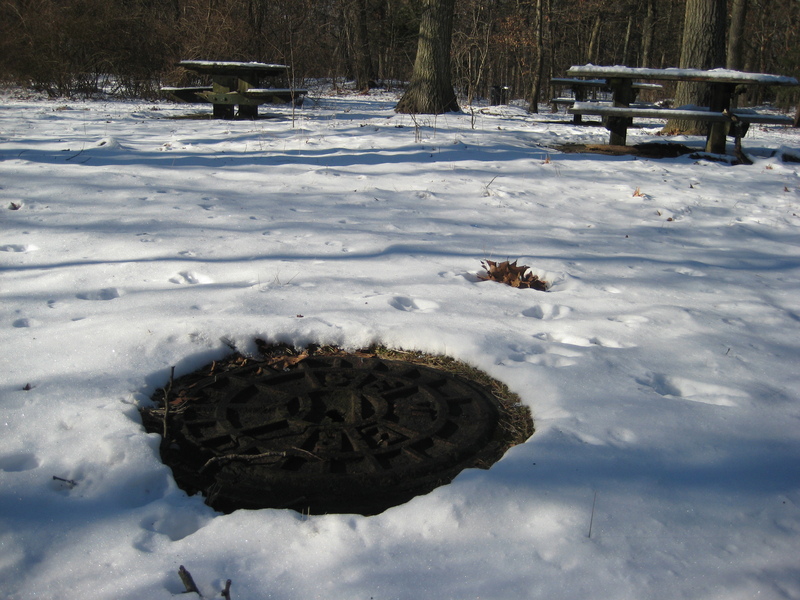 Like squirrels, there are hundreds of manhole covers in the Park. They all go underground, and I don’t have the tools or interest to open them. At least a talking squirrel could have told me I’d found what I was looking for. So after a few nice autumn days spent looking at the ground, I decided to take another approach. Checking the Boston Public Library I found an amazing resource for my research: the annual engineering and construction reports from 1879–1926! 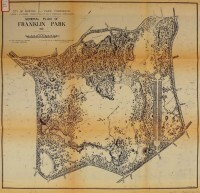 These short summaries, first issued by Olmsted and later his son and firm, and even later by the Park Commissioner, describe the work undertaken for each year of the Park’s creation. 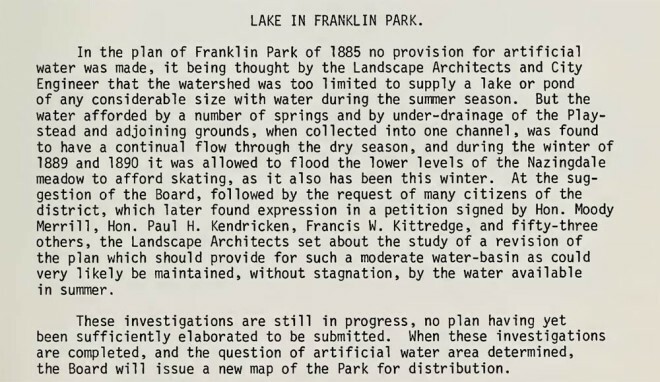 Beginning six years before the start of construction and continuing through the construction of all the roads, tunnels, buildings, ponds, golf course and zoo, these documents show all the work that went into making Olmsted’s greatest park. At times terse and others verbose, here the Olmsteds lay out their vision and the practical work of engineers, from planting trees to laying of crushed stone, the cost of purchasing sheep and pigeons, and their disappointment in the architecture of the Refectory. These documents are a short but thorough look at the evolution of farmland to recreational Country Park. This, of course, is mostly referring to the creation of Scarborough Pond, yet it also contains the first hint at the need for a reservoir. The next mention I can find of a reservoir appears in the 1896 report of work completed in 1895. I’ve included the whole engineer’s report (leaving off the long 4-page introduction by Olmsted) to show how much detail is provided regarding the reservoir versus the other work completed in 1895. Also, I included the last section because I love the description of the “donkey service” and that the “number of sheep is now 221″ because I wish there were still donkeys and sheep in the park. Armed with the information in the engineer’s reports I set out again to find the reservoir. I had a pretty good idea where to look, as there is a picnic area on top of Hagborne Hill and that seemed the best place to begin. However, I immediately ran into two problems. The first is natural: in November the ground is covered with tall grass and dried leaves, obscuring my way. The second was more human: the picnic area was always occupied. Were the occupants merely families eating hot dogs I wouldn’t have worried, but the tables always seemed to be staffed with one or two nervous-looking men guarding over large duffel bags. They were there every day for several weeks, and I began to suspect that it was a bad idea to annoy them with my camera or random wanderings in the woods. A snow-covered picnic area on Hagborne Hill. So I gave up on the reservoir and moved on to other things. Time passed and snow covered the ground. With the leaves off the trees I could explore some areas not available in the summer, and one day I found myself climbing an abandoned staircase up the side of Hagborne Hill when I noticed two exciting things. First, there were no suspicious dudes at the picnic tables, and secondly there were several manhole covers nestled along the side of the hill, just above my forgotten staircase. I had found the reservoir! After that it was just a matter of pacing out their spacing to find them all. I took some pictures and went home, content that I had found the reservoir on Hagborne Hill. I wish I had more to the story: that I could say I opened the manholes and went inside; that I made friends with the creepy dudes and it turned out they were nice and just love picnics; that some great new truth was revealed about humanity, the mysteries of the universe, or the meaning of life. Nope, all I did was find some manhole covers. But for one day that made me so very happy. Manhole covers along the southeastern edge of the Hagborne Hill reservoir. Perhaps this is why my first several posts on the topic of Franklin Park are about the “mysteries” rather than more obvious sites like The Overlook and Schoolmaster Hill. I promise I’ll get to them soon.